Reaching into my humidor this week I picked out something I’ve sort of been avoiding but I decided to have some fun and go for it out of curiosity. As far as the Cuban world goes, the Guantanamera Cristales are regarded as sort of the black sheep that are just there to lure in some tourists because of their cost. But let’s find out some more about what exactly these are. The name Guantanamera should be pretty easy for most people to recognize. It came from the title of a famous song by the Cuban composer, Joseito Fernandez in 1928. This was a hugely popular song around the world and very much became a representation of Cuba, especially during it’s push in the 1960’s. As for age of the brand, this is a fairly young cigar label as it was only introduced to the world in 2002. They were apparently available in Cuba for awhile before that, but no where else. 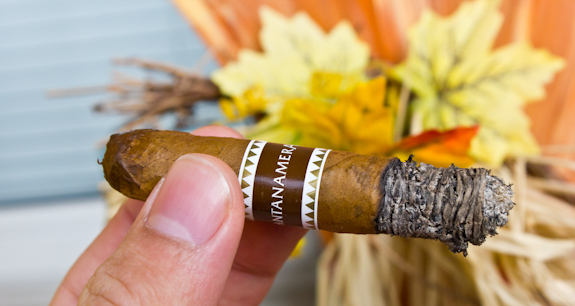 Location wise, the Guantanmera cigars get their tobacco from Vuelta Arriba, the second most important tobacco-growing region in Cuba. 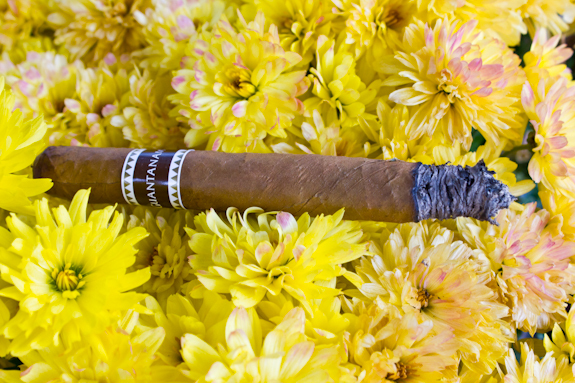 Every vitola in the line-up is referred to as “mecanizado” which simply means that they are machine made. This is where interest dies off to most aficionados. The fact that these are not hand-made makes them a sort of voodoo. 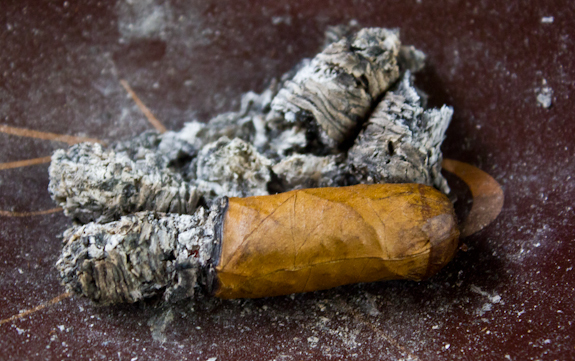 But this also helps the Cuban market by offering a very low priced cigar that is still considered to be “Cuban” and it has actually been a pretty big success. The obvious market here is people who just want to have a Cuban cigar but don’t want to spend a ton of money to try one. 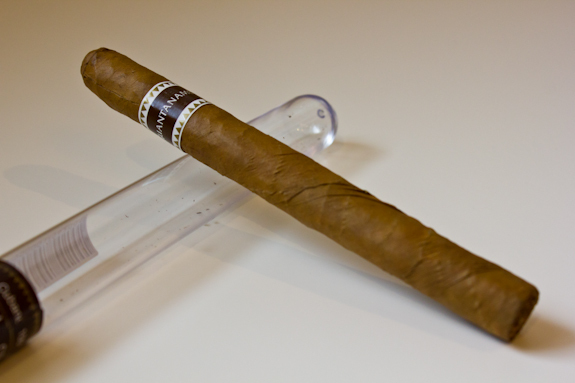 Also, they are touted as being very mild which also makes them appealing to newer cigar smokers. Now I do have a concern with the particular ones that I received. They were given to me as a gift and I’m not 100% sure of their authenticity. The band and packaging is definitely different from the ones I’ve seen in stores. But after some web searching, it seems a lot of European stores have the same pictures. It is possible the band is different or it’s changed recently but trying to find news about these seems pretty rare. Either way, lets see how it goes. And if anyone has had/seen this particular band/tube, I’d love to know if it was real or not. Now I’ll be honest, I came into this cigar with very low expectations. I know this isn’t a fancy or highly regarded cigar but I had to give it a try. To my surprise, it wasn’t terrible as I would have expected. Having said that, it wasn’t great either. What I did get from this is a mild and very one-dimensional cigar. 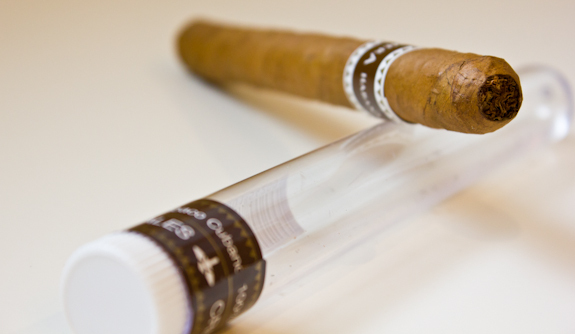 For anyone that has had a few good cigars in their day they will find this terribly boring, But I can completely see the appeal of these cigars for the very occasional smoker. 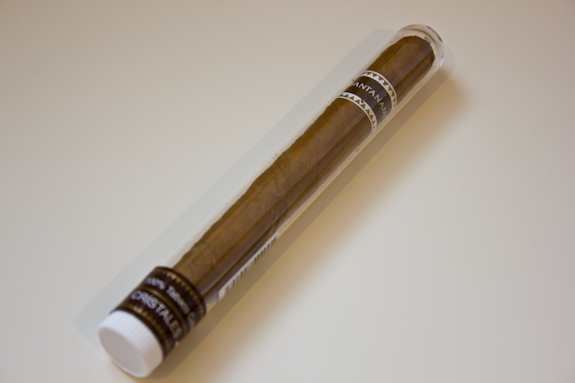 It’s very mild and has a soft profile that won’t scare away new smokers. It’s like the entry level/amateur cuban. And considering it is machine made, it actually burned quite well. 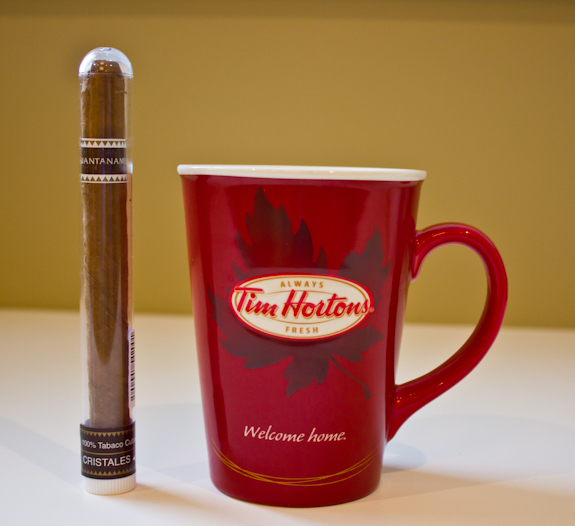 So although I may not buy these myself, they are a pretty good gift or purchase for a new cigar enthusiast. It’s coffee, nothing fancy here. It tasted like decent coffee. My wife made it and it was still hot, not even sure what beans she used but it tastes good. I prefer a really dark/strong coffee but this one was more of a medium roast for sure. Did it pair well? I’d say you can’t get much better. The very light/mild flavors of the Guantanamera Cristales went perfect with this lighter coffee, anything stronger and it would have drowned out the flavors even more. Might even suggest going for water or sparkling water as a good pairing if you really want to taste the few flavors this cigar has. Hey, are you sure Tony didn’t roll that? Just kidding, Tony, yours looked waaayyy better than that! Sounds like a novelty item for most smokers. Nice review Dan, question do you run into a lot of fakes in Canada? We definitely do! Travel to Cuba is pretty common here, it’s cheap, it’s got sun, and you get tons of food and alcohol so a lot of people go. 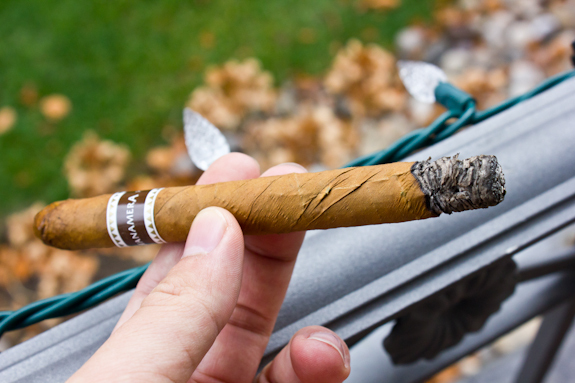 Of course, most of them are not avid cigar smokers but they all want to buy some Cubans just to try them. And most of them buy from someone who has the best “deal” but there is no such thing as a “deal” on Cubans. Most of them are right around the same price range so if you;re getting a crazy “deal”, chances are they are fake. This tourist fell for it. While cruising through the Caribbean, I wanted to pick up a couple of cuban cigars as gifts. Without knowing much about cigars (except for the occassional share with my nephew), I chose this cigar for it’s look and price – I know, the girlie way to shop. Just now popped off the cap for a sniff, and, yes, it does have a hay like smell. While I will still give them to the giftees, I will share your notes of the taste with them so they don’t expect too bold a flavor. Next time I will just pay the price for a couple of good Cubanos. Great review. Thanks. 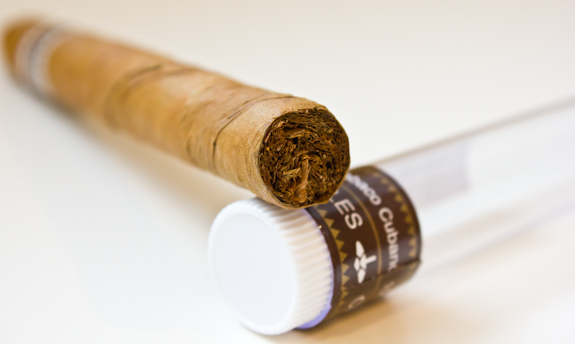 I just smok one myself that A friend brought me back from Cuba I personally concur with what he is saying in this article , I began to read the article at the moment that it started smoking from start to finish & it all was the same to me . A friend send me a box of 5 your cigars and I really enjoy them. So, I would like to sign up for emails. $22 US at Cancun airport duty-free store for a 5 pack. Same packaging as in your picture. So, must be authentic. Thanks for the review. I am new to this whole cigar scene, And yes,. I went for it because of the price and that they are actually Cubans. What do you recommend I go for next ? To develop the right taste ? Havana Club 7yr Amber Rum. My aunt just brought me back a pack of five straight from Cuba. Yes my packaging looked exactly like yours!Thank for the review! I received one from the Tropicana Show in Havana Cuba, and a bottle of Rum to enjoy the show with. Was Too busy enjoying the show for either the rum or the cigar. However the one I did received IN CUBA is identical to your pictures. Definitely Cuban. I did stop and purchase REAL Cuban cigars from the State owned stores. I have not had a chance to try them yet.